We love our patients and love working with each other! Many of us have been on the Braces by Billings team for more than 15 years. That’s because we have the best jobs in the world—helping people like you have comfortable visits, healthier treatment, and beautiful smiles. We're also happy to tell you that every one of us on the Patient Care Team, who assists Dr. Billings in treating patients directly, is EFDA Certified. That is, we have earned the designation of Expanded Function Dental Assistant. So you can be reassured that we are knowledgeable, experienced, and have solutions to meet your needs. You can learn more about us and why we love what we do! We look forward to making your orthodontic experience fun and rewarding! "As our patients’ smiles and bites improve, so does their self esteem." Cindy is excited to return to the Braces by Braces team and we are all very thrilled! She works with patients and parents to meet their scheduling needs, which can prove to be quite an adventure! She loves spending time with her husband and their four children and granddaughter. She likes to walk and loves watching her children play sports. "We treat each patient as if they are a member of our own family." Deby says she loves watching a patient’s confidence grow as his or her smile becomes beautiful! 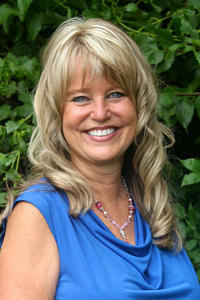 She has worked in Orthodontics with her husband, Dr. Billings, since 1979 and enjoys it to this day! Deby is absolutely thrilled to now be working their son as well, Dr. Branson Billings! Among her favorite things about Drs. Steven and Branson Billings, is that they both have a great sense of humor and are very considerate and caring towards others. Currently, Deby handles duties in advertising, office expenses, and human resources. She and Dr. Billings have five children about whom you can learn more on the web page Get to Know Dr. Billings. Her most favorite times are spent with family and having dates with her husband! 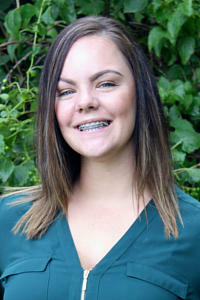 Teresa is very excited to be working with Dr. Billings again and being a part of the Braces by Billings team! We are all so happy to have her back with us! Teresa is in charge of confirming insurance benefits and filing insurance claims on behalf of our patients. She also performs many other duties that help keep our office running smoothly. When Teresa is not hard at work she enjoys spending time with her family and friends, especially her first grandchild, a beautiful little girl! "We love to work hard and see the fantastic results!" Alicia says she feels honored to work with Dr. Steven Billings because he is not only a well-respected Orthodontist, but also because he genuinely cares about patients and their concerns. Alicia is excited to welcome Dr. Branson Billings to the office, and to be a part of a growing practice. Alicia's responsibilities include chairside duties and Treatment Presentations. 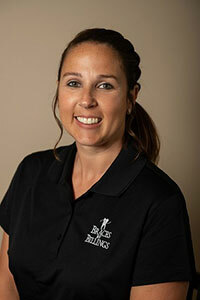 She has worked in the field of Orthodontics since 1998 and has been with Dr. Billings since 2007. 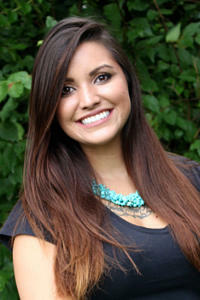 Alicia loves to see how Orthodontic care positively affects a patient's self esteem. You'll often hear Alicia talking about her husband and little girls and the joy they bring to her life. "I love working with our patients, both Dr. Billings' amd co-workers!" "We know how details matter while we remember to care." Casey's favorite thing about orthodontics is how involved she can be in creating a beautiful smile while assisting both Dr. Billings and Dr. Branson Billings. The best part of working with Dr. Billings and Dr. Branson Billings is the level of respect and time they give to each and every patient. They alway makes sure the patient knows exactly what is going on in treatment and wants everyone to be comfortable and confident about his or her smile. 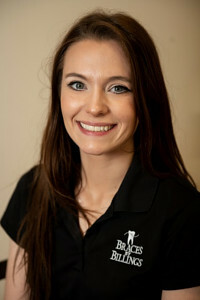 She has worked in the orthodontic field since 1998 and has been with Dr. Billings since 2011. Casey is the mother of two sons, Blake and Dane, and she enjoys spending everyday watching them grow and explore the world around them! "I love to make each patient visit a fun experience." Debbie began to work for Dr. Billings in the year 2000. She has worked in the dental and orthodontic field since the 1980s. It was important for her to work for the best orthodontist in the area. Dr. Billings is a perfectionist and will put forth the extra effort for each patient to have that perfect smile. Debbie's duties include assisting with placing braces, removing braces, wire changing, taking X-rays, and creating impressions. When out of the office, Debbie enjoys spending time with her family, gardening, boating, and traveling. Her newest joy is her grandson Troy! "I love how much laughter there is in the office!" 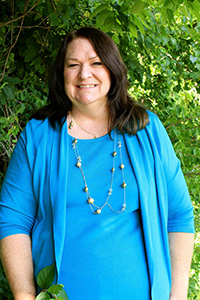 Donna says her favorite thing about Dr. Billings is his sense of humor and his exceptional care of our patients. She has worked in the field of orthodontics since 1981. 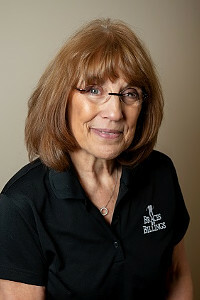 She has been part of Dr. Billings' team since 1985. 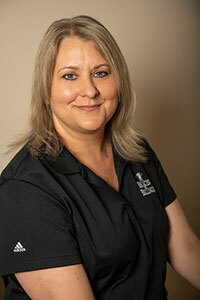 Donna joins Dr. Billings in working directly with patients to help them feel more comfortable, assists in setting up bondings, and performs many other chairside assistant duties. Donna loves spending time with her husband and family. She enjoys being outside with her dogs and caring for the flowers in her garden. "I love seeing the kids AND their parents smile!" 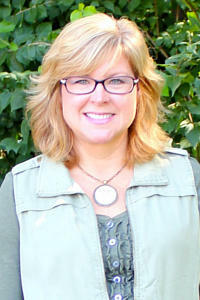 Jane has worked in Orthodontics since 1989 and has been Dr. Billings assistant since 1999. She says the best thing about her job is getting to know the patients and watching their smiles grow more beautiful. 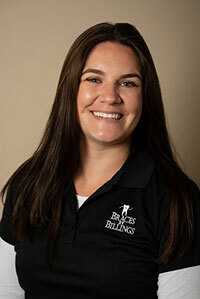 She enjoys working with the exceptional team at Braces by Billings and looks forward to Dr. Billings son, Dr. Branson Billings, joining the practice! 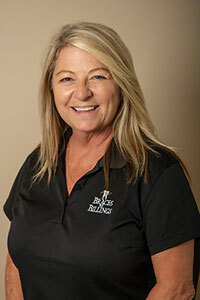 Jane is involved in every aspect of patient care, including assisting Dr. Billings with teaching cases, ordering and stocking supplies, sterilization of medical equipment, and lending a hand to front desk scheduling. She loves her home in the countryside and spending time with her husband, children and granddaughter. "I love to help create a beautiful smile that will give someone the confidence to achieve anything!" 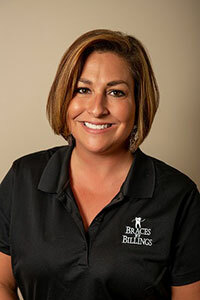 Jonna joined the Braces by Billings team in 2014 and loves it! She says Dr. Billings, staff and patients are wonderful and makes coming to work everyday a delight! 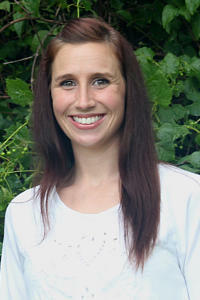 Jonna spent a year working in general dentistry and has transitioned to orthodontics in 2012. Jonna graduated from an ADA-accredited dental assisting school with honors in 2011. She loves everything about teeth and helping everyone achieve the perfect smile! Outside of work Jonna volunteers yearly for TeamSmile as a dental assistant providing free dental treatment to children. She also volunteers as team manager for her daughters cheer squad and Girl Scout troop as cookie mom and campout chaperon. Any other time available she spends with friends and family. "It's so fun getting to know our patients and I love our team!" "I love helping to make beautiful smiles"
Mary says her favorite thing about Dr. Billings is that he is very particular about giving the patient the best care possible to create the best smile possible. She enjoys working for patients of all ages, getting to know them, and seeing them grow in confidence. Mary especially likes to watch the process of making beautiful smiles from beginning to end. Mary’s duties include working chairside to assist Dr. Billings with placing braces and changing archwires. 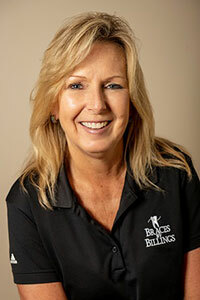 She has worked in the field of orthodontics since 1975 and has been with Dr. Billings since 1990. She is married with three children. 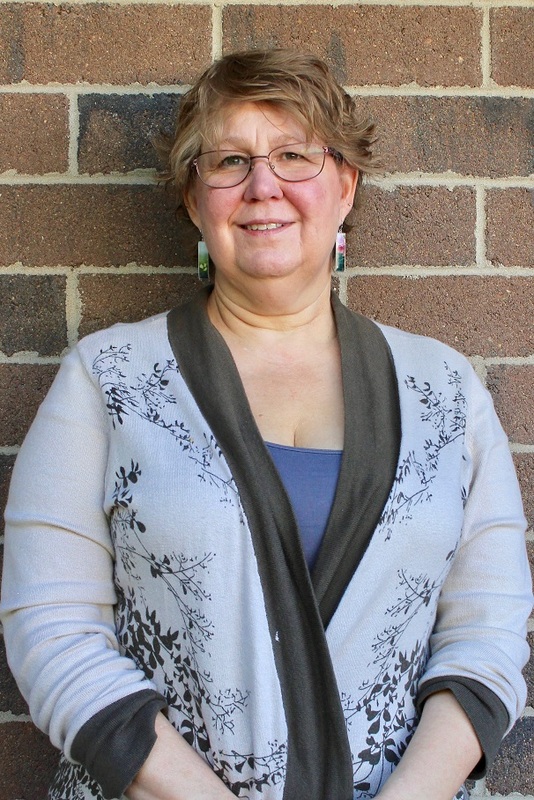 Her activities outside work include crafting, making jewelry, sewing, and enjoying her children and three grandsons.